He’s holding steady at 26 lbs. All that running around has really started slimming him down (not that you could ever call him slim, lol). His thighs are still nice and meaty, but he’s definitely getting longer instead of wider. He’s wearing 2T pajamas…hold me! 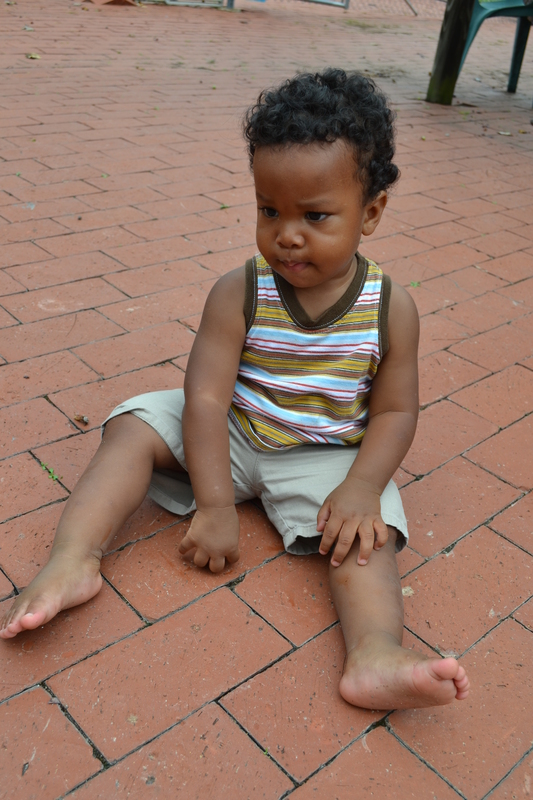 His feet are ginormous – he’s a 5 1/2 extra wide and we had to special order him shoes to get ones that fit him right. His feet are almost as wide as they are long, lol. I continue to be amazed at his new words and signs. He can sign up and down (and say “down”) and hot and cold, and so many more new signs. He can sign several words in a row now to communicate – he will ask for “more milk please” when he wants to nurse. 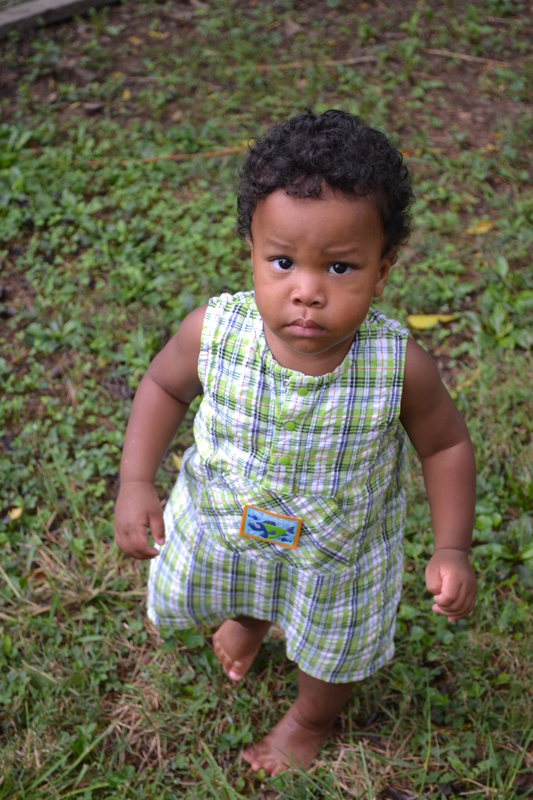 He loves going up to a wall or door and saying “na na” (knock knock). Every time he leaves a room, he’ll turn around and wave and say bye with what sounds like a very strong southern accent – “bah”. He understands so much – it constantly surprises me. He listens to our conversations and just takes it all in. He loves hearing us talk about him. He loves talking to the little boy across the street – While I was chatting with the mom, Isaac stood there and had a parallel conversation with her 6 year old son. We stopped talking and realized that he was babbling away furiously, with hand gestures and everything, while her son just stood there and listened. He looked at me and said, “I can’t understand anything he’s saying!”. Ha. He’s become so much more attached to his Daddy lately. 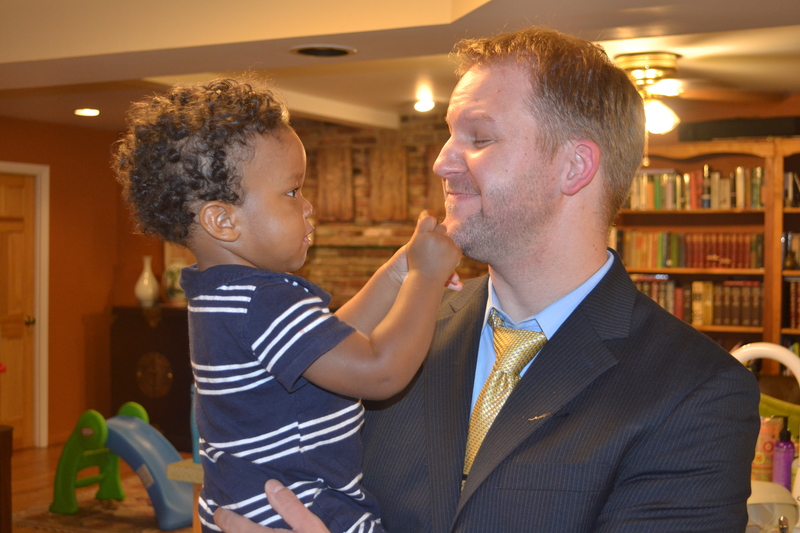 He recognizes him in pictures around the house, pointing and saying “Dada!” and leaning in for a kiss. It’s hard for Hubby to leave in the mornings, but we have a routine down now to watch Daddy’s car drive away and we talk about how Daddy is going to work and will be back tonight to see Isaac, and it usually keeps the tears away. He’s so affectionate, it just kills me. Last night while saying good night to his Daddy, he kept leaning in for a hug and just laying his head on his Daddy’s shoulder and squeezing him (while he was in my arms). Over and over and over again he’d just lean in for another hug, so sweet and serious. When I finally tore him away to take him to bed, he waved and blew kisses. Oh, I could just melt. Throughout the day, if I’m sitting on the ground he’ll run up behind me and practically tackle me he hugs me so hard. If I kneel down and hold my arms out, he’ll run full speed into them and just squeeze me tight. There is absolutely nothing better, no way, no how. He takes a while to warm up to women, and really is disinterested in most females, but he loves most men immediately. And the rougher looking, the better apparently. At the MVA the other day, he picked out the toughest looking guy there with tons of tattoos and made friends. The guy told me “maybe he’s good luck”. I asked him if he needed good luck, and he responded that he was there for a hearing, so yeah. I wished him luck and at that moment Isaac started to yell “yay!” and clap wildly, which made us both break out laughing. If a guy has tattoos, you can bet Isaac will want to befriend him – he loves pointing at all the pictures (this one guy had both a boat AND a pirate guy with a hat – big win!). He loves old men with walkers. On our recent trip to Missouri, every time my brother in law was around he’d run up and hold his arms up wanting to be held. 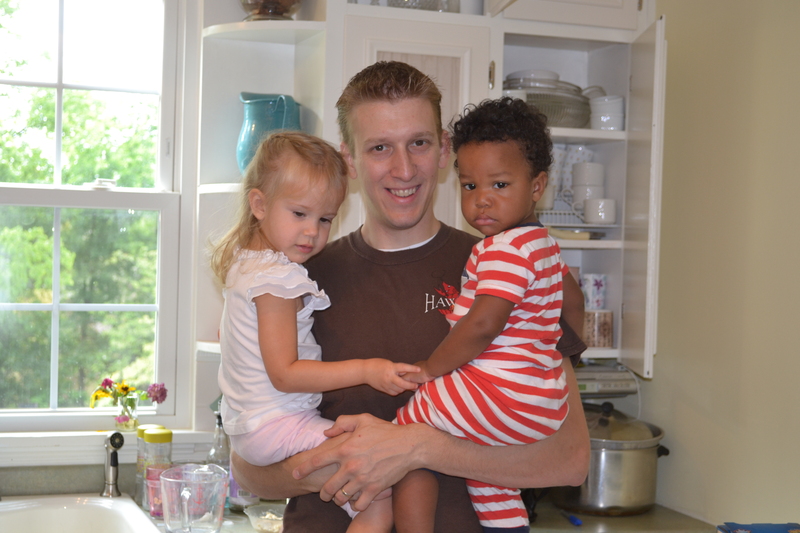 He’d hug Kyle’s neck and settle into his arms happily (much to the chagrin of my niece). Playtime has gotten pretty serious these days. My little man plays hard! 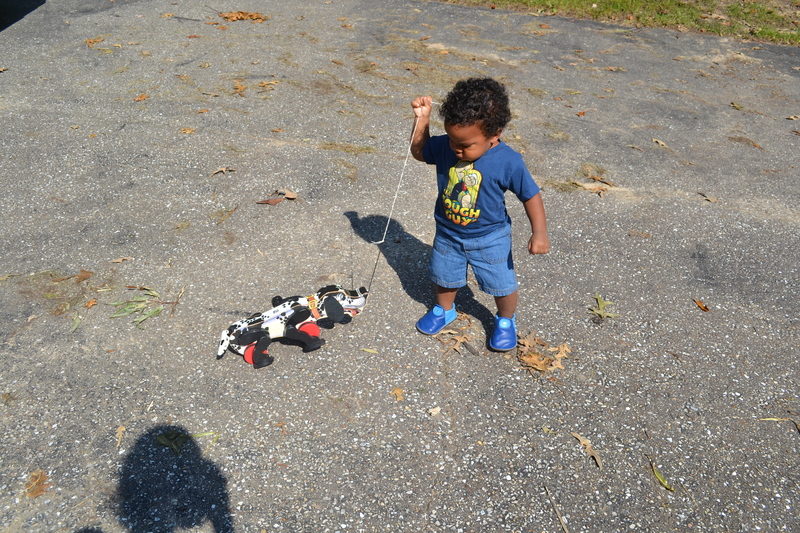 He runs all over the house, filling the wastebasket with books and carrying it around, or filling the dog bowls with puzzle pieces and carrying that around (see a pattern here? 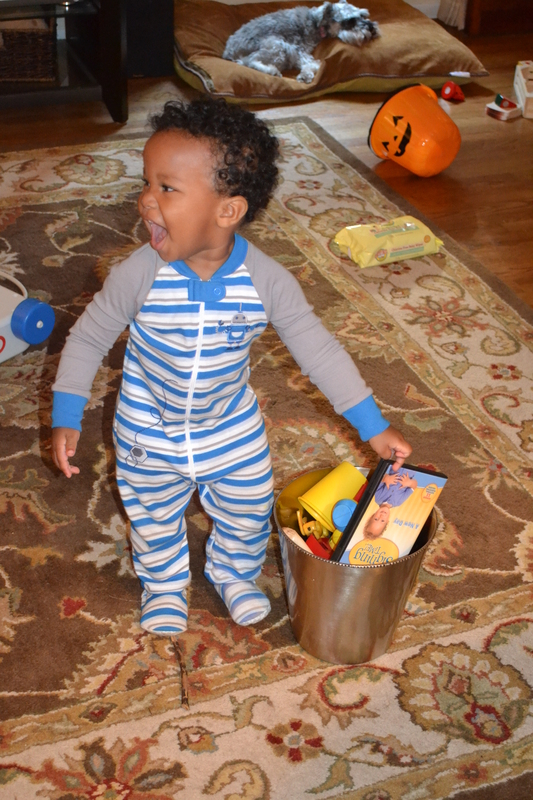 ), or carrying his new pumpkin bucket around and picking up random objects to put in it. 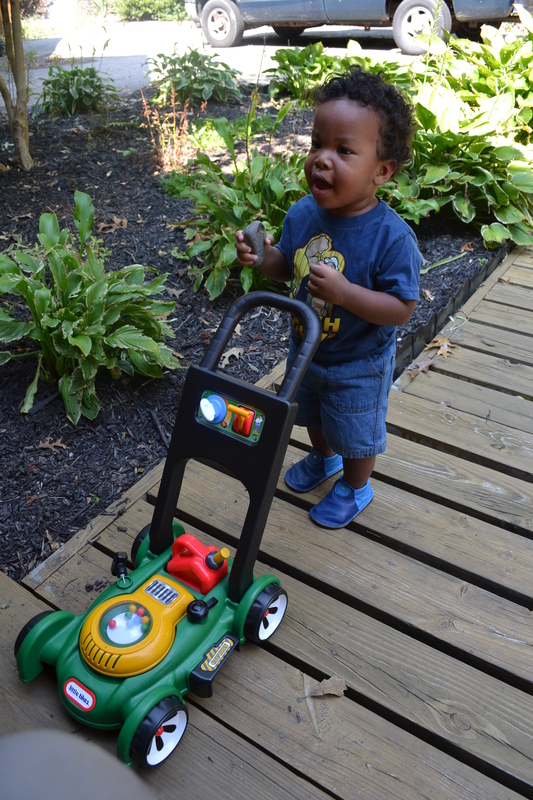 He loves his new lawn mower from his aunt and pushes that all over the house and driveway, stopping to pull the little pull cord that makes engine sounds. He loves rocks, oh boy does he. He’ll fill his little fists with rocks of all sizes, and when his hands are full, he’ll pop a few in his mouth. 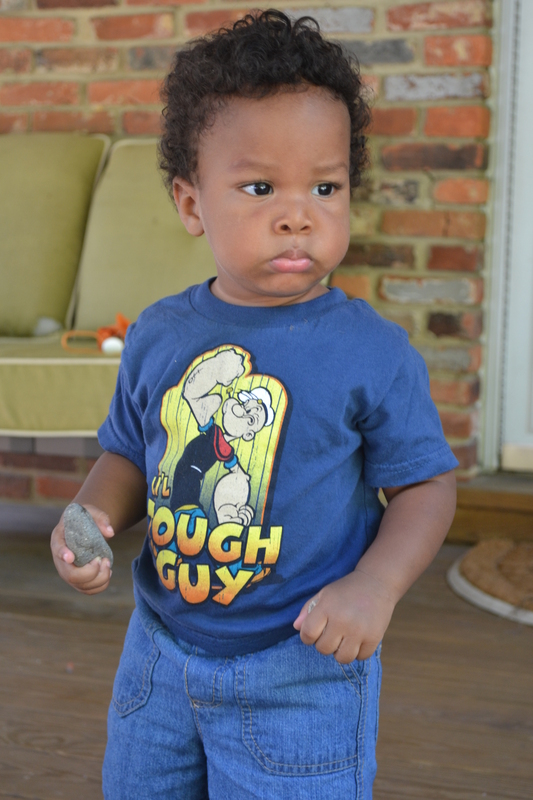 He picks up rocks on our walks around the neighborhood, and tries to bring handfuls into the house. Luckily he hasn’t discovered his pockets yet – I’ll be in trouble when that happens! Isaac still loves throwing anything and everything out of the doggy door, or through the cat door down the basement stairs. He’s also really interested in the trash can these days, prying the lid up and reaching in at every opportunity. I had just tossed the leftovers from his dinner in the trash, when he reached in and ate squash right out of the can before I could stop him! GROSS. He wouldn’t eat it off the plate, nooooo, but out of the trash, sure! This past week, I was cleaning out my linen closet and he was upstairs with me, relatively unsupervised for a few minutes although he was just a few feet from me the whole time. I looked around after just a few minutes and he was throwing everything he could find down the stairs – every couple of minutes he’d run into his room and come back out with something else to toss. 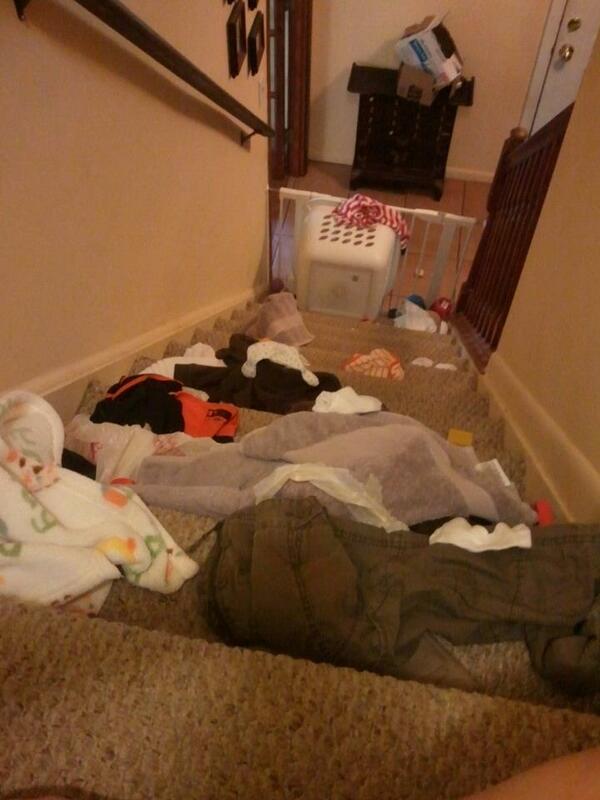 His trashcan (complete with dirty diapers), towels I had stacked on the floor behind me, stuffed animals, articles of clothing, toys, all were chucked down the stairs in less than five minutes. 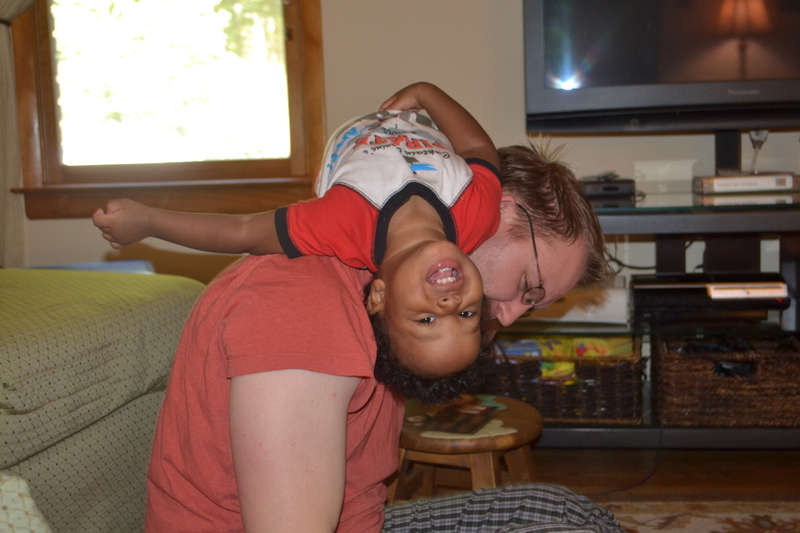 It’s just so much fun to have a toddler. Yes, some things are hard, like when they refuse to let you feed them and they want to use a fork or spoon to eat all by themselves (he’s getting better at it, though! ), or when they want to help sweep or vacuum, or they refuse to ride in the stroller because they want to walk, yet they won’t walk in the same direction that you want to go. But man, seeing the little personality emerge, watching as they start to understand new concepts every day, just watching them as they learn and grow…it’s so incredible. I can’t get over how lucky I am every day to be parenting this sweet little guy. He is just so smart, so sweet, so beautiful, that it takes my breath away. September 23, 2012 in Isaac.